Not much on anything with a tilt-back headstock and I don't usually bother trying to wind a whole bunch of string onto those for that reason, but it makes a difference on guitars with a shallower angle and/or longer run to the tuners. Shallow enough and you'll get some ringing past the nut and a "plonk" with a heavy hand -- think Telecaster G strings. So I'll try to wind most of my Fenders down close to the bottom of the tuner shaft on all the non-treed strings. That's what I like to see, I like my girls with nice tight curls. But I wrap mine with nothing but sheer friction of string against post, just a little slight arc where it enters the hole, that tightens up and disappears under tension. THAT's the tricky part, allowing enough leader for sufficient wraps while still keeping the string taught enough between nut and posthole to wind evenly on the post, and keeping that "arc" from becoming a kink, which kind of defeats the whole purpose of using a pure friction wrap. I just think it allows the best fine-tuning. PS is it just the photo angle or does that "B" slot look like it's not quite centered up between the G and the E? A highly-respected luthier's trainee did that on the G slot when I got a bone nut and saddle put into the D25 when it got its first re-fret. It was driving me "nuts" for a couple of hours until I looked closely and figured out what was going on. And this guy was actually the Doobie Brothers' tech (!) whom I shall leave unnamed out of sheer courtesy. He did replace it no charge, but I never went back. Figured he should have caught it in the first place. Last edited by adorshki; 03-20-2019 at 07:57 PM. Strings're less likely to pop out of their slots is only thing I can think of. If you get binding on the nut something's wrong with the nut slot, I never had that on any of mine. I thought the same thing Charlie. AFAIK, break angle is only important over the saddle, because it helps drive the top of an acoustic guitar. 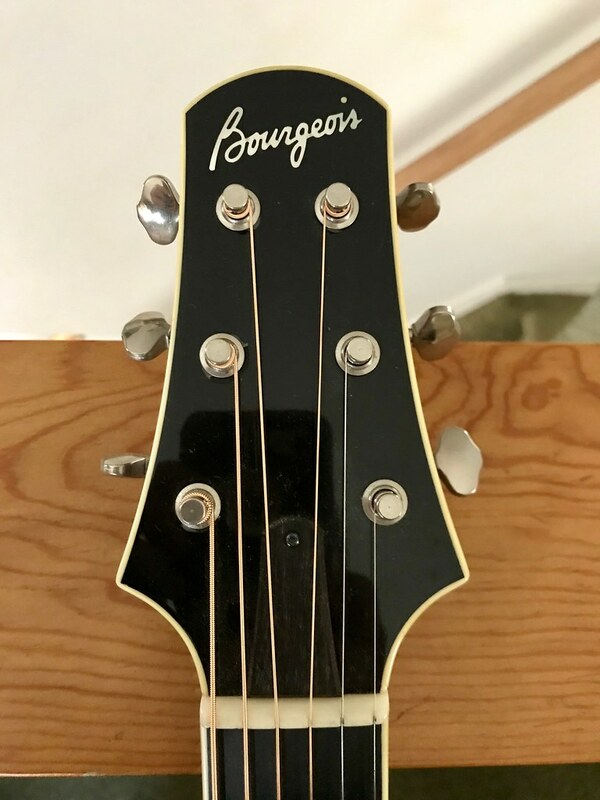 I've always preferred headstock designs where the trajectory of the string between the nut and the tuner post was as straight as possible, like on my Bourgeois. FWIW, I only call it the "Taylor Method" because that's where I found it! The down angle behind the nut can affect quite a bit. Binding is probably not an issue much with bone and a properly sized slot. For a .036" string, you'd use the .042 file, give it a little room (warning, this is from memory). The down angle affects playability or "bounce" in the nut area, the cowboy chord area, among other things probably. Early Gibson guitars had pronounced headstock pitch, 17º. Gradually, through the Norlin era the angle got shallower and shallower to prevent breakage (also added a nice volute ;-) until the headstock was virtually flat like a Fender. This really killed the playability up by the nut (and the tone), the guitars just don't have the same feel, it's harder to get your fingers under the strings perhaps. 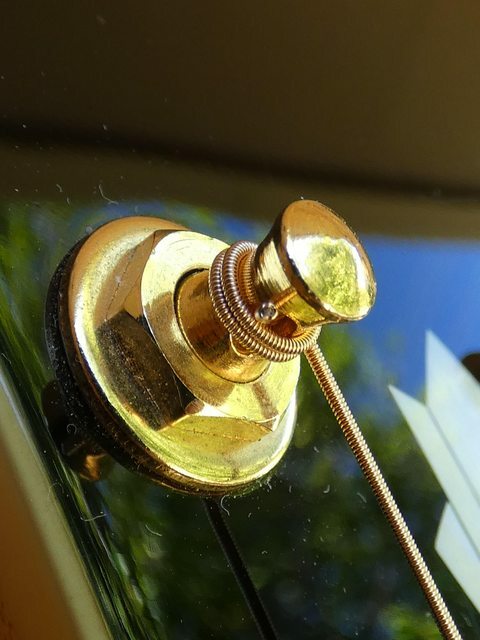 Same thing with down angle at the bridge/tailpiece on a Les Paul/SG/335 stop tailpiece stye guitars. If you slam the tailpiece to the body, you get the greatest amount of resonance, sustain, and also the best playability. Most rock stars seem to like to screw the tailpiece right down to the wood, I aways do. 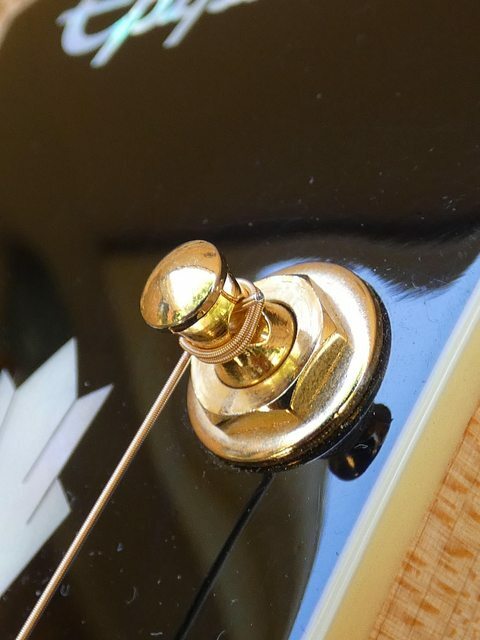 But others like to do that and then wrap the string around over the top of the tailpiece, lowering the tension by raising the break angle for a mushier feel. Down angle at the ends of strings seems to be a really important thing. I think you have the right amount of wrap on a Guild style guitar (pitched headstock) when the strings are perfectly perpendicular to the headstock face. Often times, you need extra wraps on the shortest strings to achieve that angle. The Eric Johnson Strat actually has tuners that get short as you get farther from the nut so as to not need a string tree. Last edited by Guildedagain; 03-20-2019 at 08:54 PM. I use a version of the 'Taylor' method, however, I do not 'pre-cut' the string. Just string through the tuner - pull back a little slack - start winding - all winds under the 1st one (No 'one over, rest under') - string up to tension then cut off excess. These are DR Sunbeam round core PB's on my Epiphone EJ-200 and the tuning stability is superb. What's going on with the nut there, are my eyes playing tricks or does the nut look stepped up at the ends? And you're right, some guys, like Leo Fender wanted the strings to go through the nut straight. But then he added a string tree to add down angle to the longest strings. Later, they added a second string tree, and used the windings on the low E and A strings to push the strings down a little. This is why Fender guys (as previously mentioned here) like to overwind the bass strings a little. Last edited by Guildedagain; 03-20-2019 at 09:01 PM. I keep a spool of waxed dental floss in my kit for this - I floss my nut slots every time I change strings.